As you may have seen on the first episode of BBC2’s Million Pound Menu, a few weeks back, Shrimpwreck has gone from strength to strength since they started out trading at the now defunct Platform 2 Market in Waverley back in early 2016. Aside from regularly trading at multiple events across the central belt, chef and owner Ewen has recently diversified his offering with the launch of Ough! Bagels. It currently trades Friday to Sunday from the compact kitchen space of the Thistle Street Bar. On a very sunny day, I timed it perfectly (or otherwise) to find myself dining to the unlikely backdrop of the wedding ceremony of the Earl and Countess of Dumbarton. Having ordered half of Jarl from the bar, I popped up to the galley kitchen counter and said hi to Ewen. I ordered the Brick Lane bagel which comprised salt beef, pickle and mustard (£6.50). I added a portion of crispy fries (£3). I’ve included the prices of the food for reference but Ewen was kind enough to refuse payment from me. 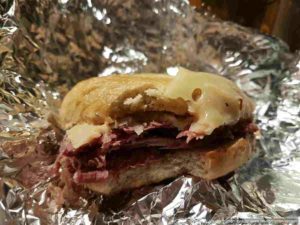 The bagels and salt beef are both created in-house which is no small feat. The freshness of the bagels is particularly impressive given the constraints of the tiny prep kitchen. 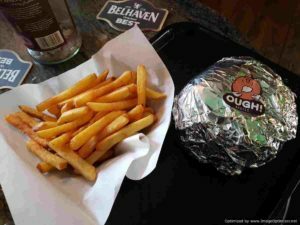 Things arrived with the bagel wrapped in foil and the fries looking pretty good. Once things were unwrapped, the bagel looked monstrous. The chips were really good and will feature prominently when I get round to compiling the #chipquest rankings. But the bagel and the beef were the stars of the show. The bagel had a really pleasingly crisp outer shell which soon resolved into the distinctive chewiness that the boiled bagel dough gives things. The salt beef was splendid and the pickles had good crunch. It was so enjoyable that I went back the following week with guest quester Stan. We sampled excellent pastrami on their reuben and were impressed with their chicken wings. So overall, Ough! looks to be doing excellent work. 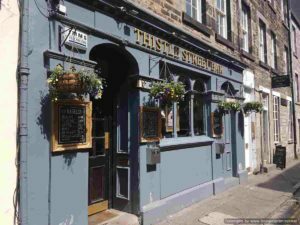 I think they recognise that maintaining consistency of the bagels during busy service is likely a challenge from their current premises, but the Thistle Street Bar should give them a good platform to sustainably build an appreciative audience. Give them a look next time you fancy a high quality bite with your pint.